We’ve been a little distracted for the past week, new babies, another new baby that is just learning how to waddle and getting quotes to build a new fence for animals (sheep! alpaca! bunnies!) Pretty soon, I’ll have to rebrand this site to be “Steamy Farmer” right?! So, dinners recently have been super quick-cooking meals and raiding my pantry/refrigerator for something to cobble together. This is one of them. In fact, I think Thai Curry is the queen of emergency quick-cooking. 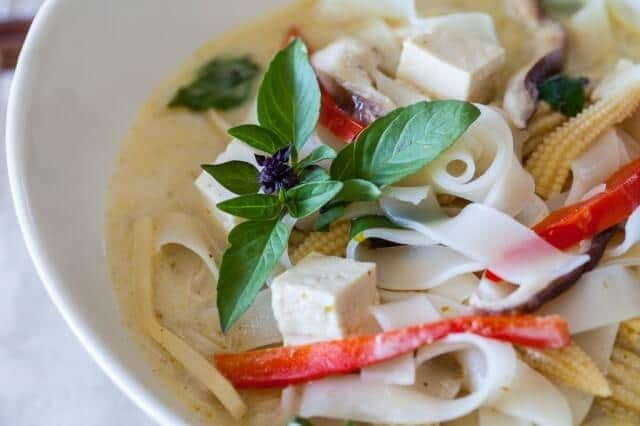 Pantry – Thai curry paste, coconut milk, carton of vegetable broth, rice noodles, bamboo shoots, baby corn. All of the refrigerator items are long-lasting type of ingredients that stay fresh for about a week. 15 minutes tops, from pantry/refrigerator to table. If you are using rice noodles, soak the noodles in hot tap water (not boiling water, just use hottest water from tap) for 10 minutes. Drain. If you're not using rice noodles, cook noodles according to package directions. In a wok or a soup pot, heat oil over medium heat, add in curry paste and fry for a few seconds until very fragrant. Be careful not to burn the curry paste. 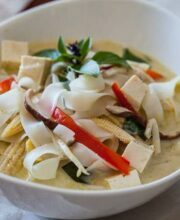 Pour in 2 tablespoons coconut milk and whisk with the curry paste until combined. Add the remaining coconut milk and the vegetable broth and bring to a simmer. 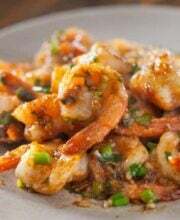 Optional- stir in the fish sauce or soy sauce. Give the soup a taste and add more curry paste if you'd like it spicier. Add in the vegetables and tofu. Cook for 3 minutes or until the vegetables are cooked to your liking. (If you're not using rice noodles, see below.) Add in the drained rice noodles and boil until the rice noodles are cooked through, about 60 seconds to 2 minutes depending on the thickness of the rice noodles. Stir in fresh basil and serve immediately. 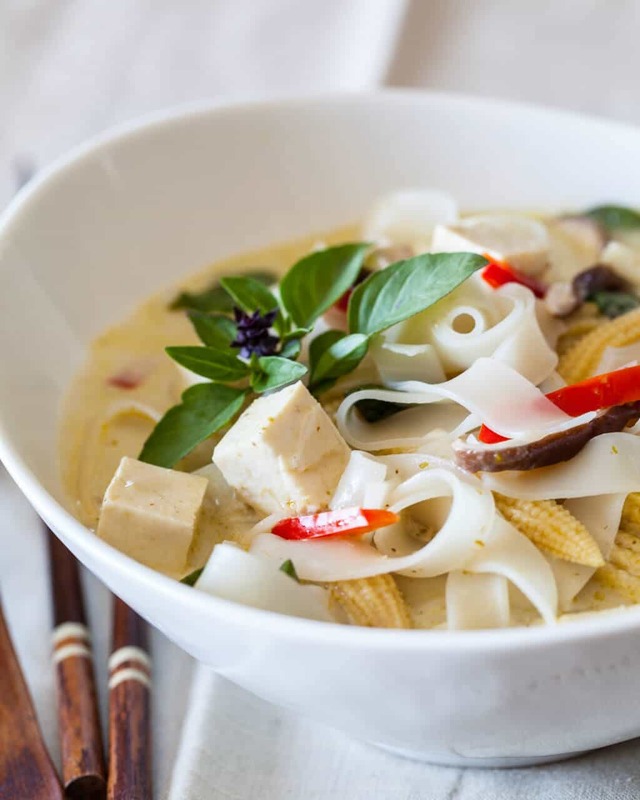 * If you are NOT using rice noodles and have cooked the noodles according to instructions on the package, divide the cooked noodles evenly into 4 serving bowls. Stir in fresh basil in the vegetable curry soup and pour over the noodles. Thank you so much for this recipe. I used it for my GCSE food tech course work and got an A!! Can’t thank you enough!! 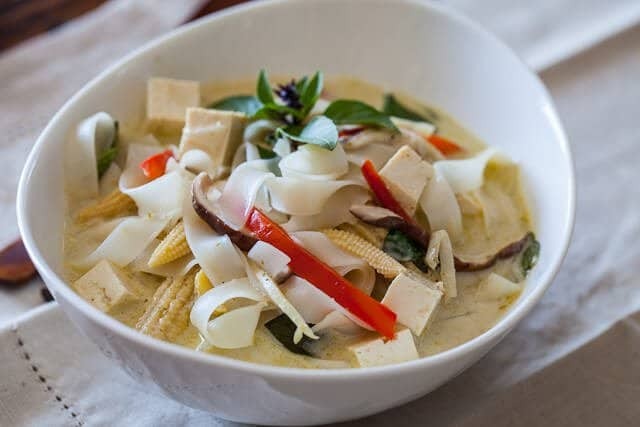 I saw that in your video for vegetable Thai curry noodle soup, you said to soak the dried rice noodles in hot water but in your recipe. It said to soak it in cold water. Which one is it? It’s very confusing. Oh boops! Either is fine, but I prefer hot. I’ll fix the recipe! Thank you! I made this recipe today and unfortunately it did not work out so well, it turned out bland and there were too many noodles to call it soup. I am not sure what happened, but I think what I did wrong was using the wrong curry paste. Normally for Thai dishes I use the authentic curry paste from the Asian market and this time I used some red curry paste made by “Thai Kitchen”. Also, I think that using sweetened coconut milk might have helped the flavor, along with a little more fish sauce, and next time I will use less noodles. I substituted chicken broth for vegetable broth because that was what I had on hand, and that didn’t help. great recipe. Im gonna try this at my home tonight. I’m no longer certain whether this publish is written by way of him as no one else realize such designated approximately my difficulty. You are wonderful! Thanks! often come back in the future. I want to encourage you continue your great writing, have a nice holiday weekend! 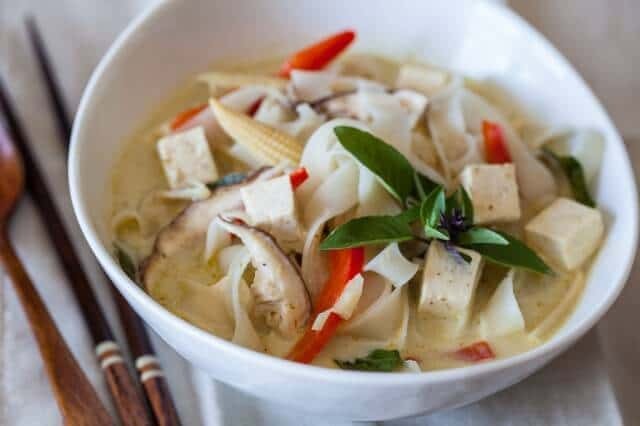 Love Thai curry, this looks so comforting and flavorful. Such a good way to use up a variety of vegetables. Jaden, I love curry and this soup sounds divine! Yum! I love when you can pull pantry staples and make a quick meal! This lookes SO damn good! This sounds crazy good! Yum!